Your discarded computers, solar panels, refrigerators, and more could be worth over $60 billion. The world is making progress on addressing the environmental problems that are plastic waste and plastic pollution, but there’s always more we can do to protect our environment. One area that desperately needs attention is how we deal with e-waste: discarded electronics, appliances and other products that have batteries or plugs. According to the new Global E-waste Monitor 2017 report from the United Nations University (UNU), e-waste increased significantly from 2014 to 2016. An overwhelming 44.7 million metric tonnes (Mt) of e-waste was generated in 2016 — 8 percent higher than the 41.4 million Mt produced in 2014. This waste includes TVs, smartphones, solar panels, refrigerators, and many other devices. Their number is expected to rise by another 17% by 2021, where it will amount to nearly to 52.2 million metric tonnes of e-waste. What’s more, only 20 percent of the world’s e-waste was accounted for in 2016, meaning only a relatively small portion was collected and recycled. The report finds that 4 percent of e-waste was thrown into landfills, while the remaining 76 percent was likely incinerated, recycled by third-party organizations, or stored in people’s homes. The ways in which smartphones and TV are produced and released has increased the frequency with which people are upgrading the electronics. Affordability has also had an impact. If your old TV, vacuum, or phone isn’t going to a friend or family member, chances are its getting thrown away. The E-waste report suspects small equipment (vacuum cleaners, electric shavers, cameras), large equipment (washing machines, clothes dryers) and “Temperature exchange equipment” (refrigerators, freezers, A/C units) will see the fastest growth in e-waste generation. These three categories are already responsible for 75 percent of global e-waste. Phones, TVs, PC monitors, printers and various lamps are expected to grow at a slower rate. Per capita, Australia, New Zealand, and the nations of Oceania contribute the most to the world’s e-waste, at 17.3 kilograms per inhabitant. Europe is the second largest generator of e-waste at an average of 16.6 kg per inhabitant, with North America and South America following behind at 11.6 kg per inhabitant. 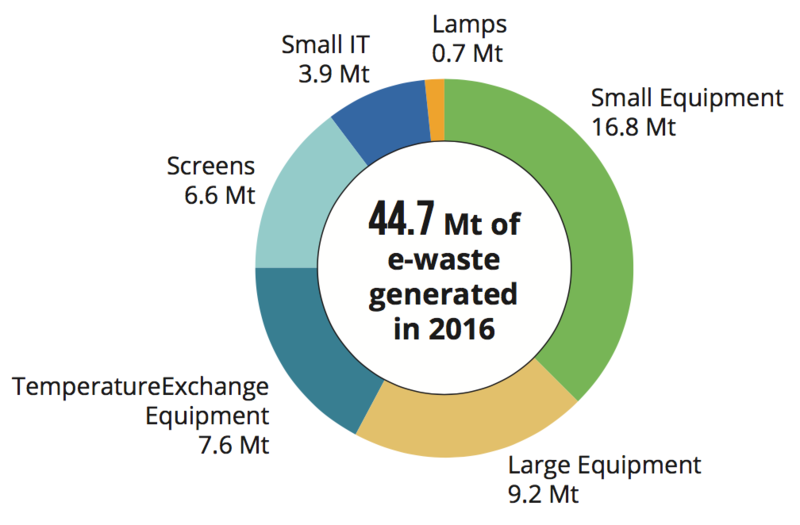 In order to offset the tonnes of e-waste around the world, the report encourages improved tracking of e-waste and the resource recovery process. Designing electronics and electrical equipment with eventual recycling in mind would also go a long way, if only to make the recycling process easier for people. We’ve seen people make their own version of Tesla’s Powerwall and an all-electric BMW from recycled components, so there are definitely benefits to encouraging people to recycle their electronics. That isn’t to say all countries have neglected e-waste. In fact, according to the report, nearly 66 percent of the world’s population live in countries with e-waste management laws in place. It’s just a matter of enforcing these regulations, making people aware of them, and making sure they’re all similar to avoid confusion. Improving these policies would do more than just save our environment; they’d also lead to the creation of more jobs refurbishing and recycling this valuable waste. The report estimated that the value of raw materials in all e-waste in 2016 was roughly 55 billion Euros (US $64.7 billion), more than the GDP of most countries.